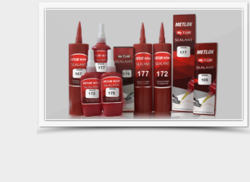 Metlok Private Limited - Manufacturer of hydraulic thread sealant, uv adhesive & godrej locking solutions in Bengaluru, Karnataka. Threaded connections are required to seal gases, compressed air and liquids like hydraulic oil besides water. A designer of machines and equipments has always desired hassle free and reliable sealants for their threaded joints. Traditional 'Teflon Tapes' used for sealing hydraulic connections often shred and block small orifices leading to valve malfunction. Jute twining used for sealing GI pipe joints are not foolproof and must be torque to provide a seal. They also do not prevent corrosion in the fittings. Solvent based sealants are not good as the evaporating solvents leave behind leakage paths as they escape. Metlok brings to you several technologies to seal threaded joints which address the above issues. These include liquids and pastes for low volume and maintenance use and pre applied for high volume production use. 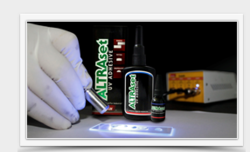 UV Adhesives are single component adhesive, solvent free, that cure when exposed to Ultraviolet rays. Used to bond glass to glass, glass to metal components such as precision optical instruments, electronic devices. This adhesive is cured within seconds. Its excellence in mass production significantly helps reduce the production processes. 1. UV curing has been shown to increase production speed, improve scratch resistance, and increase product throughput. 2. They can cure at a low temperature. UV adhesives can be used for both potting and bonding. Used to laminate glass to glass for decorative application. Used for bonding and potting in electronic and electrical components. The accepted solution to prevent loosening is 'Chemical Locking', either in the liquid form or microencapsulated. METLOK brings to you two world class products for you to choose from: the liquid range 'My-T-Lok' Anaerobic Adhesive and the Microencapsulated range 'Precote' which can be pre-applied to your threaded parts before they are used. The pre-applied range also includes non reactive grades which give you what is called the 'loss locking'. These grades are generally used for low tensile fasteners (class below 8.8) and/or for screws or bolts which may require retightening or adjustments during their service life. The traditional die cut cork and paper gasket have several limitations and performance issues. There is a unique gasket for each joint. Permanent set or compression of gasket leads to reduction in bolt tension and reduces the sealing capability. Sweating, tear and dripping are often found when such traditional gaskets are used. The modern technology 'Formed in Place' gaskets overcome the above draw backs and are perfect choice for a variety of applications where the operating temperatures do not exceed 250°C. They offer good chemical resistance and virtually life long trouble free performance. Potting is a process of filling a complete electronic assembly with a solutions for resistance to shock and vibration, and for exclusion of moisture and corrosive agents. Single component epoxies are used for high strength and high impact bonding of magnets in the assembly of starters and alternators. Low temperature curing grades can be used for assembling and potting electronic circuits. Anti- Spatters are efficient way of protecting fastener threads from weldspatter and electro deposited paints.Fluoropolymer powder is applied on fasteners to form a protective coating. The coating prevents the adhesion of electrodeposited paints, primers and coatings. They protects against weld spatter, adds lubricity to fasteners and reduces torque vs. tension scatter. They improves lubricity and reduces installation drive friction. METLOK Provide Curing Systems for curing all your UV Adhesives and Sealants used in different applications, Metlok provides appropriate solutions for all your applications as a complete system with Adhesives. The System emits low temperature strong UV light with the UVA intensity greater than 3.5mW/cm2. This strong UV light makes most UV adhesive cure in matter of seconds, ideal for high-volume production and short cycle. Joining is an old assembly process to produce goods. In the 'engineering' domain joining or bonding becomes a precision task, with durability and performance under various operating conditions to be sustained. The challenge is more these days with newer materials of construction being specified for various components and products. Metlok brings to you a range of products that you can choose for a variety of bonding, fixing, gluing and joining needs. These are single component instant bonding adhesive for small area bonding and can be used for numerous bonding applications on the assembly floor. The range below differentiates product by chemistry. Metlok also provides specially designed products and primers for bonding substrates having low surface energy.